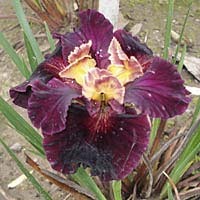 Recent Pacifica Iris selections are starting to look very red, but first selections of this rich color appeared decades ago in mid 20th Century hybrids. photo from SPCNI photo collection. 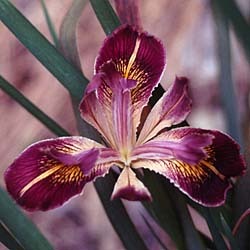 "The first "red" iris I ever saw was Dr. Lee Lenz's Claremont Indian. He produced it in the 50s, in a cross of innominata and probably douglasiana. 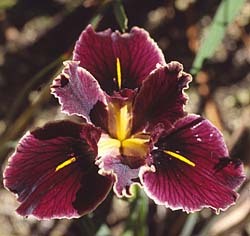 reddish irises that appeared in Southern California, such as 'Pasadena Indian' and 'Native Princess' by George Stambach. came from Hargreaves. Spelling approximate. 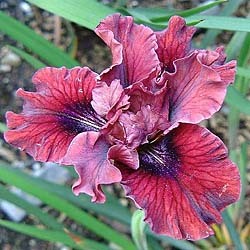 From that iris came the Ghio reds. Of course hybridizers were using both 'Claremont Indian' and 'Emigrant' right away." The early reds had species-like petals, much narrower than present-day hybrids, with reduced ruffling and narrow standards and style arms. Signals were typical of species, edging and veining were both restrained, and flowers tended to hold up well in inclement weather. By the late 20th century, ruffles, wide flower parts (falls, standards and style arms), bright colors and increased complexity in patterns on falls were, and still are, developing from year to year. 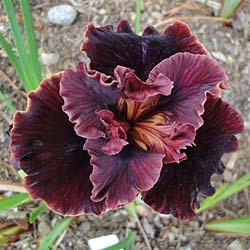 I'm not going to show all fifty plus 'red' PCI selections (you can look them up in the Iris Encyclopedia), but will list some of them, focusing on those that are important for breeding, toughness, depth and complexity of color, and other desirable traits. PCI 'Indian Maiden', by George Stambach, R. 1971. 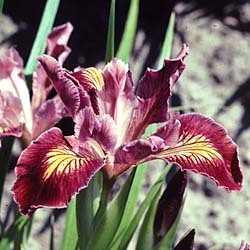 'Indian Maiden' was another Stambach hybrid that showed complex dark veining on a lighter background. This patterning is an attractive feature of new 21st century hybrids, in a variety of color combinations. PCI 'Mission Santa Cruz' (R. Ghio 1982) is still an useful parent for new hybrids. Its petal colors are intense, and carry forward into new hybrids a distinctive deep color saturation and sturdy petal structure. 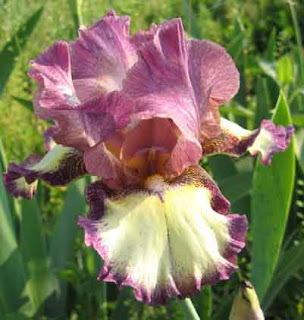 In England, Marjorie Brummitt produced a series of Banbury hybrids during the latter part of the 20th Century, including 'Banbury Gem' (1972) and 'Banbury Melody' (1983). 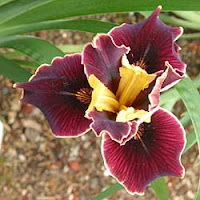 'Adept' (Ghio, 1997), 'Battle Alert' (Ghio, 1995––and the name should be a clue that this is one of the very dark red hybrids), 'Common Sense' (Ghio , 1997), 'Endless' (Ghio, 1985), 'Escalona' (Ghio, 1994), 'Gamay' (Terry Aitken, 1995), 'Junipero' (Ghio, 1989), 'Mission Santa Clara' (Ghio, 1992), 'Opulence' (Elaine Bessette, 1996), 'Riva' (Ghio, 1988), 'Town Belle' (Elyse Hill, 1998), and 'Upper Echelon' (Ghio, 1988). 'Salsa Picante' looks back at 'Emigrant' in a modern, sturdy plant with flowers held upright. Two recent introductions by Debby Cole, 'Red Delicious' and 'Scarlet Woman' also edge closer to solidly red flowers. PCI 'Dracularity', another Debby Cole introduction, is an intensely colored flower, reminding us of the color blast that comes from well saturated petals, in this case with light edges. PCI 'Tulum', R. 1996, Joe Ghio. 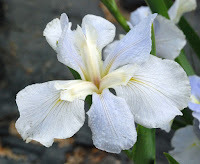 This article ends with another hybrid from Joe Ghio, 'Tulum', which shows more ruffles, wider flower parts, and in this hybrid, a dark signal and veining on a lighter background. 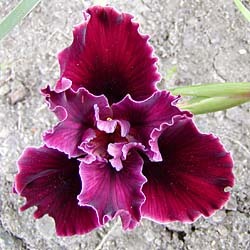 It's a lovely hybrid with a velvety surface and in full sun, a pinkish red. Most of the photos in this article are from the SPCNI photo collection, with thanks to Ken Walker, Recorder, for sharing them to this blog. Emma Elliott shared 'Salsa Picante'. I also thank Richard Richards for his comments on early red PCI hybrids. 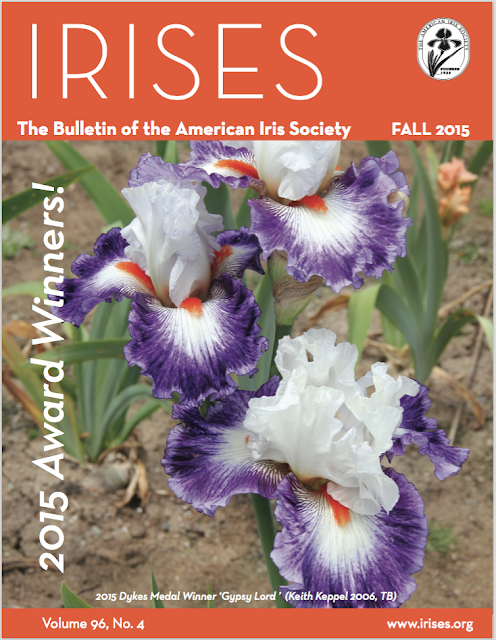 A warm welcome to another wonderful issue of IRISES, the Bulletin of The American Iris Society. As you can see from the cover below it features 2015 Dykes Medal Winner 'Gypsy Lord' by hybridizer Keith Keppel. The Fall 2015 issue of the AIS Bulletin is now available for online viewing within the Emembers section of the AIS website. Note: to access this area of the website you must have a current AIS Emembership. AIS Emembership is separate from the normal AIS membership. Please see the Electronic Membership Information area of the AIS website for more details. In this edition you will enjoy the images of all 2015 AIS Award Winners, starting on page 2, including all three Wister Medal Winners, 'Money In Your Pocket' by Paul Black, 'Snapshot' by Thomas Johnson, and 'Temporal Anomaly' by Rick Tasco. On page 7 don't miss a beautiful picture of 'Royston Rubies' by Adam Cordes, the winner of the Lloyd Zurbrigg-Clarence Mahan Cup for Best Iris Seedling at the Portland, OR Convention. It was an exciting seedling to see doing well at most Convention gardens. Before we can set out on the road to success, we have to know where we are going, and before we can know that we must determine where we have been in the past. A Siberian iris was the first runner-up to the Dykes Medal, after judges voting for iris awards this year. 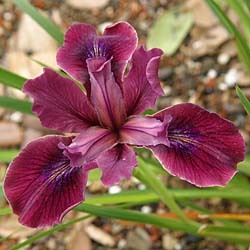 'Swans In Flight' (Hollingworth 2006) may be the closest siberian iris to date to winning the Dykes Medal. The Portland Convocation was fully covered in this edition of IRISES, starting on page 12 with articles and photos by Jim Morris, from Missouri; Stephanie Markham, from Massachusetts; Ginny Spoon, from Virginia; Bonnie Nichols, from Texas; Chuck Bunnell, from Indiana; and Kate Brewitt, from Canada. On page 28 you will find a full list of 2015 AIS Awards. 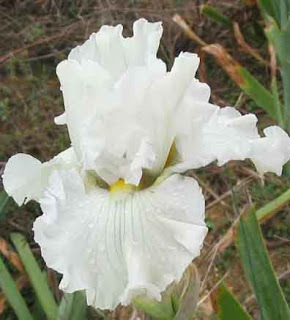 Read the continuation of an amazing article called "The Long Road to a New Iris in India: Part 2" awaits you on page 36. A fantastic dedication to the passing of David Cadd (1945 - 2015), written by Jim Morris is on page 50. We will miss you David. Lastly, don't miss news about the 2016 National Convention to be held in Newark, NJ and at The Presby Memorial Iris Gardens on page 51, with a Registration form on page 52. (FYI, the website for the convention can be found here). There's a lot more to see and read in this edition of IRISES, either in digital or print formats. If you are an AIS member know that you will receive the print edition soon (it's in the hands of the Post Office), or if you are an e-member, then that version is already available online as mentioned above. If you are bored with blue, you might want to move on to greener, or more psychedelic, pastures. 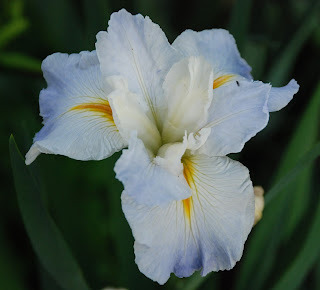 This post is just about the pursuit of pale blue tones in Louisiana iris hybrids. Kevin Vaughn calls them “icy” blue, and the color has intrigued several hybridizers. In a way it is odd that it would be necessary to hustle after pale blue Louisiana hybrids since the color is found within the natural range of the blue species, I. giganticaerulea, I. brevicaulis, and, possibly, I. hexagona. There are rare white forms of each, of course, and the intensity of the predominant blue color sometimes shades gradually toward white. I don’t know much about the East Coast I. hexagona, but I have seen native stands of brevicaulis in Louisiana that exhibit a considerable range of blue hues within a short distance. A case in point is a light blue in Gary Babin’s yard in Baton Rouge. Gary has maintained an extensive planting of brevicaulis in many shades that originated with collections from a nearby wetland many years ago. Almost all flowers are considerably darker, some a fairly deep blue-purple. Several I. giganticaeruleas or related specimens are another example. One, found in LaPlace, Louisiana, is the palest blue, nearly white. Most giganticaeruleas are a darker blue, blue-purple or blue-lavender. 'Eolian' - Photo by Robert Treadway. When I started with Louisiana irises in the late 1970s, Charles Arny’s ‘Eolian’ was the iris held up as the lightest of blues. It’s still grown and sometimes wins shows, but ‘Eolian’, while lighter than most blue Louisianas, really is not the icy blue that has obsessed some of us. Three examples of icy blues emerged in the 1980s: ‘Delta Dove’ (Dunn, R1984); ‘Ice Angel’ (Faggard, 1988); and ‘Southdowns’ (O’Connor, registered in 1992 but first bloomed in 1980). All these irises approached or met the color requirement, and they also offered a larger, fuller flower than ‘Eolian’. I can’t speak from much experience about ‘Delta Dove’ and ‘Ice Angel’, having only seen them sporadically, but ‘Southdowns’ is mine and I am well acquainted with its characteristics. Some people say that it lacks substance. I say, however, that it is a gossamer thing of ephemeral beauty – that lacks substance. So what if you can almost see through a petal? Isn’t everything supposed to be “transparent” these days? Does the judges handbook suggest that poor substance is a fault? 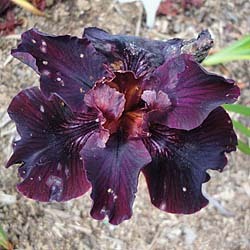 Afraid so, but it is a great grower and a fine garden iris that looks especially nice at dusk and in a little shade. ‘Southdowns’ may not be covered by the Second Amendment, but no one is going to take it away from me. Another attribute of ‘Southdowns’, if you look closely, is that it really is not blue. The color upon opening consists of fine purple veins over a white ground. With time the purple lightens, and even at first and from a distance, the eye sees it as pale blue. Newer icy blue hybrids are actually icy blue. These early light blues did not seem to come from a disciplined pursuit of that color. Dunn’s ‘Delta Dove’ might have, in that one parent was a seedling from two whites, ‘Ila Nunn’ and a white giganticaerulea (‘Her Highness’). The cross was a wide one, however, with the other parent being the famous red ‘Ann Chowning’. It was a roll of the dice for blues, but they produced a winner. Nothing is known about the parentage of ‘Ice Angel’, and ‘Southdowns’ came from a bee pod on ‘Cajun Caper’ in the first year I fiddled with seeds. (I am sure that the other parent was the blue ‘Mac’s Blue Heaven’ but I did not make the cross. ‘Cajun Caper’ is a red-violet blend with a strong orange suffusion). Later hybridizing has been more systematic. There are five irises I would cite as modern examples of work leading to icy blue Louisiana irises. Three are mine: ‘Bywater’ ( R2005, Southdowns x Lake Sylvia); ‘Faubourg Marigny’ (R2011, Bywater x Beale Street); and ‘Estelle Egan’ (R2013, Bywater x Sinfonietta). The fourth is ‘Sarah Faith’ (R2008, Dural Bluebird x Jeri) by the late M.D. Faith. 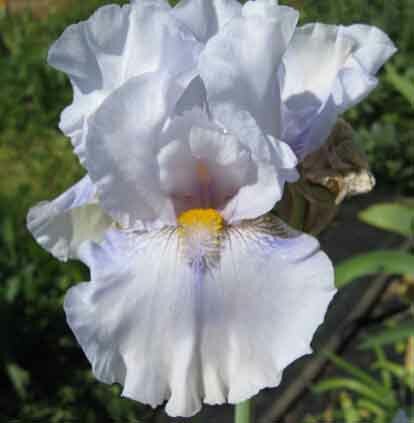 The last and most recent is Kevin Vaughn’s ‘Aqua Velva’, (R2014, Beale Street x Dural White Butterfly). ‘Bywater’ is actually blue, and like ‘Southdowns’, a very good grower. The flower form is nearly overlapping, but depending how they are held, some blossoms may appear a bit open. ‘Faubourg Marigny’ is an even lighter blue. In fact, it opens a pale, pastel blue over a white ground, and it does fade to near white. Those icy genes clearly are there, however. ‘Sarah Faith’ got by me. 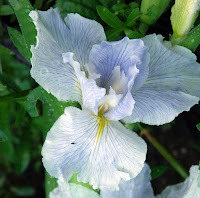 I have only seen a picture sent by Robert Treadway, who told me about the iris. It is a beautiful, ruffled pale blue. Robert says the iris has a nice stalk, too, so everything considered, it was a real loss not to have grown this one, so far. Judging from just the picture, it is right similar to the next iris. ‘Estelle Egan’ probably is my best pale blue. It has the color right and adds both ruffling and improved substance. The iris grows well and forms a nice clump. I have only seen Kevin’s new ‘Aqua Velva’ one time in a garden, but it looks like a fine addition. It certainly has a good pedigree, and what a perfect name! 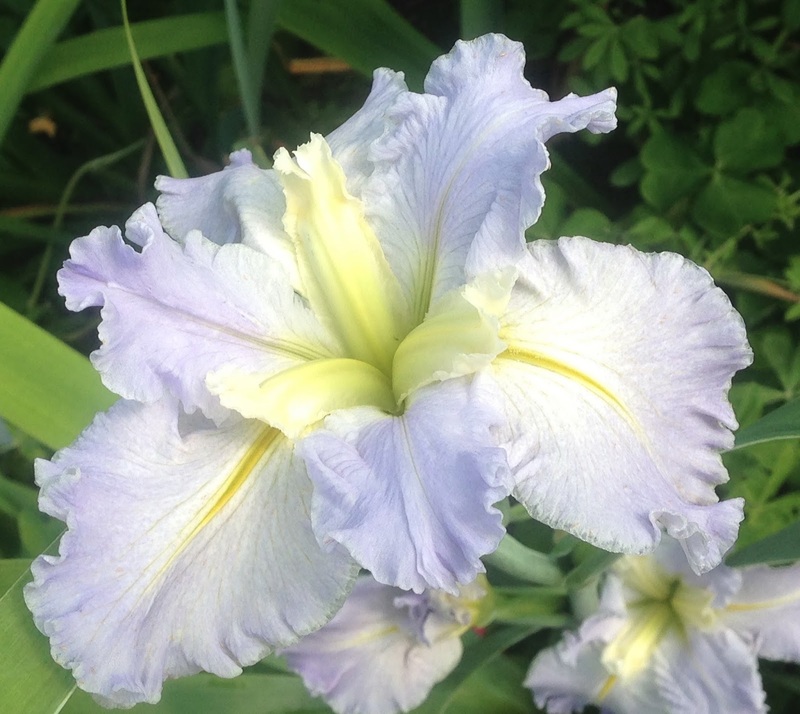 I am excited about a new iris that popped up in the pursuit of light blues. ‘House of Blues’, currently in process of registration, comes from a cross of the pastel blue ‘Faubourg Marigny’ and the pastel pink ‘Birthday Suit’. ‘House of Blues’ may not qualify as icy, but it definitely is cool. If anyone else is intrigued by icy blues, the groundwork done should support real progress. A good strategy might be to work with strong whites and blues as well as with the existing icy hybrids. 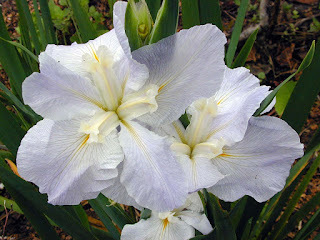 It should be possible to develop pale blue irises with many of the good attributes of modern Louisianas. They are almost indescribable, the exhilarating feelings that accompany the preparation for a very special celebration taking shape within the team getting ready for 2020, the Centennial founding of The American Iris Society. We hope that you will join us not only in the celebration itself but also in every step we take to get ready for the Anniversary. Please join us as a volunteer, as a contributor of ideas, or simply by sharing all of our communications regarding the festivities with your friends and family. It is with great pleasure that we start communicating with you by announcing the winner of the 2020 AIS Centennial Logo Contest. You will be seeing the winning logo (above) from now on in all of our communications regarding the AIS Centennial, be it online or via printed material. 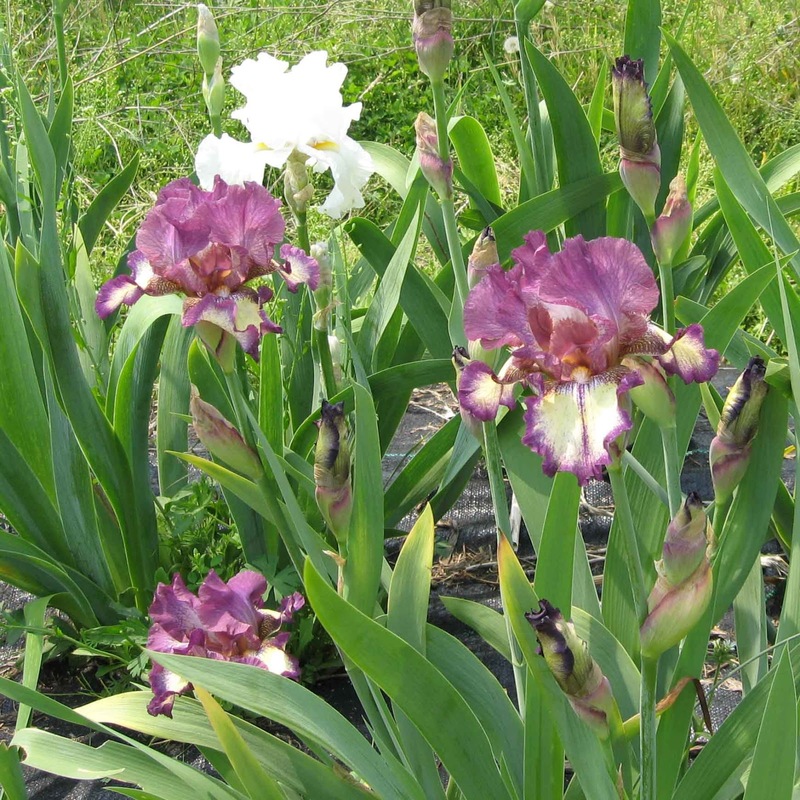 It was chosen unanimously by all committee members, and we particularly enjoyed it because it contains all the many types of irises we all enjoy. We also want all of those who entered the Logo Contest to know how grateful we are, and how much we appreciate them. The AIS 2020 Centennial Committee members who chose the winner felt thrilled to have viewed the different ways all of you expressed your creativity and love for irises. And, the winner is Lori Galletti! 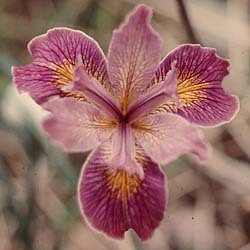 I currently live in , PA and I belong to The American Iris Society, HIPS, Delaware Valley Iris Society, and I have irises on the brain. For the last 4 years I have slept, dreamt and daydreamed irises. I moved from Long Island, NY to Wyomissing, PA approximately 8 years ago. When I bought my home, my mother shared with me her purple irises, which my father gave to her when they bought their first home. Because they were NOID's, I began investigating their origins and during my research I came across Bertrand Farr. I found that the home I am living in, and the entire surrounding development, is on the land that was originally Farr Nursery. 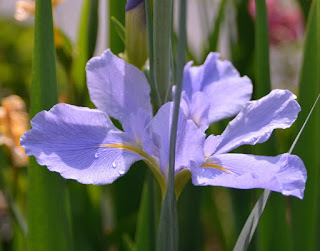 From that moment on, I have been actively collecting irises and Farr Nursery memorabilia. In 2013, I purchased a collection of all the remaining artifacts from Farr Nursery and donated it to the New York Botanical Gardens. Included in the donation were Victorian era Dutch Boy and Girl costumes which were used in advertising Tulip Time at the Nursery. Two children would dress in full costume and greet customers as they arrived. It was so romantic and charming, it showed me the world through Mr. Farr's eyes. 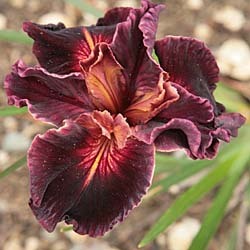 His spirit lives on in his irises and his enthusiasm can still be felt and is quite infectious. In February of this year, part of the collection went on exhibit at the Reading Public Museum. The museum generously hosted a Bertrand Farr exhibit, celebrating his 1915 gold medal win for his irises at the Panama Pacific International Exposition in San Francisco. Quaker Lady garnered special attention at the PPIE and was Mr. Farr's personal favorite. She is my muse as well. 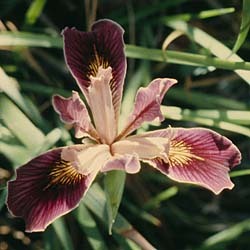 And as an artist, I tend to sketch and photograph her more than any other iris in my garden. When I first moved to Pennsylvania, I never expected to go on this journey, and I have to say, it has been exhilarating. 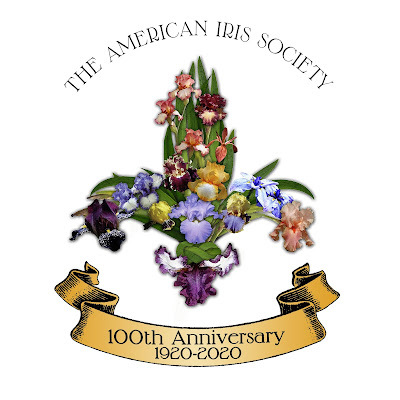 Having my design chosen for the AIS Centennial Celebration is an incredible honor and a highpoint in my love and obsession with all things iris. Many thanks to Lori Galletti for her wonderful work! 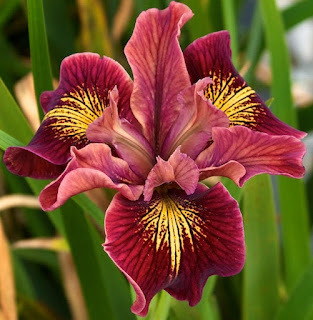 Red is not a natural color for iris flowers, and so it is of course one of the most sought after goals among Iris breeders. 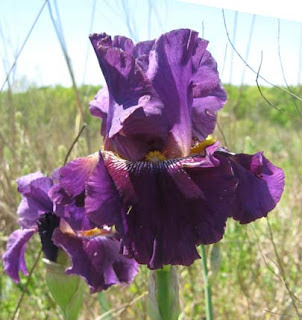 Flower color in the genus Iris comes from two different parts of cells in flower petals, cell sap and plastids. The pH in the cell affects the sap colors. Growing temperatures, soil pH, and soil nutrition may also affect colors in both areas of the cell. One color portion comes from the cellular sap, the fluid inside each cell in the flower. This sap is the source of cool colors––blues, lavenders, purples. Cell sap colors are very sensitive to pH. The other color portion is in cell organelles, plastids, which are the source for warm colors, primarily yellows and oranges. For flower colors that nature did not design, breeders tweak the balance between colors in the cell sap and colors in the plastids. Well, that is the outcome of what they do. 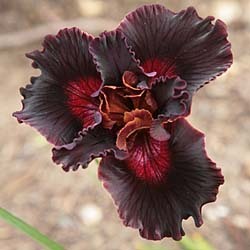 In the garden, breeders select, year after year, for the plants that come closest to the colors they are looking for. There is also some serendipity––the breeder might not have been looking for brilliantly dark red falls with golden streaks, but when these appear, wow! While looking for Pacifica Iris to feature in this article, I requested red photos from SPCNI members and the photo collection. Ninety plus images later, my head reeling from an abundance of choices, I decided to post them in several sets, sorted by hue and intensity. As we've just passed the Autumn celebrations of Halloween, Day of the Dead, and Samhain, this article features dark, intensely red to near black PCI flowers. Joseph Ghio has been breeding more intensely colored PCI for years, see the hue intensity ramp up from 'New Blood' and 'Pop Idol' to 'War Zone' and 'Red Flag Warning'. I live on the Pacific Northwest Coast, and we've already had a few red flag storms blast through this fall, so I appreciate this name! Intense reds don't stop here. They keep going to near-blacks and dark red purples. 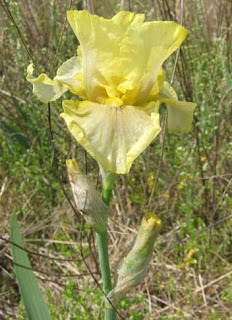 PCI 'Brand Name' has intense coloration in all flower parts, the signal is small, even the style arms are darkening up. It is clear that near black flowers aren't too far away. Pigment levels are getting very intense. Not surprisingly, the names are getting intense too! My former plant physiology instructors would roll over in their graves if I failed to mention green plastids. Green plastids are in all plant cells, and are called chloroplasts. They contain chlorophyll and accessory pigments, and capture light to make chemical energy to fuel plants. These green plastids largely disappear in mature flowers, as the flowers take on other pigments, stop growing, and expand into open flowers ready for pollination. OK, duty done, next, on to more reds, pinks, and red-orange-yellow PCI flowers. All of the photos in this article are from the SPCNI Photo Collection, shared by Ken Walker, SPCNI Recorder to this blog. In this post we're dealing with dominant (selfs) and recessive (plicatas) traits and the resulting seedlings. There are many dominant traits and many recessive traits, but this will only deal with selfs and plicatas. Lots of fun and a few surprises. 'All Revved Up' is one of my plicata rebloomers. It is a child of 'Radiant Bliss' and contains some genetic material for color from the west coast, mainly 'Gigolo.' It has bloomed in all months from May through October. 'Lunar Whitewash' is a white reblooming iris introduced by Sterling Innerst. It is a good cycle rebloomer. Both are rebloomers and both have good form. 'All Revved Up' has good branching and bud count, but is a little short, while 'Lunar Whitewash' has great form, but really lousy branching. The goal was a really good meeting of the genes and interesting colors. 'All Revved Up' with 'Lunar Whitewash' behind. If you cross two plicatas you will get mostly, and usually all, plicata seedlings. With a decreasing number of plicata genes within the solid or self, you will get a varying number of plicata seedlings, but most will be selfs, bicolors and variegatas. If there are no plicata genes in the self, as appears to be the case with 'Lunar Whitewash,' there will be no plicatas, but there will be haft lines. The seedlings have varied with most being the same or near the combination of 2527-02. 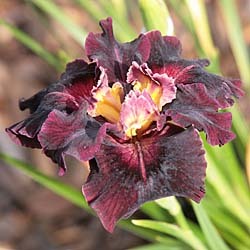 This is my favorite of the purples since it produces a large number of stalks and blooms. The white one, 2527-01, is a bit taller with really consistent spring stalks, and probably my favorite of all the results. Although any color is possible with this combination, the yellow, 2527-06yellow, came as the biggest surprise to me. Lack of rebloom was the most shocking, but they were in a bad bed. In earlier years, plicatas provided a large part of the base for rebloom. It should be no surprise when haft lines show up with plicatas x self crosses. It's been explained to me that this is not a "plicata effect," as I'd thought, but simply that the lines are not considered a default in the plicatas so they were not bred out of them, therefore, they show up in the children. It's not uncommon for my gardening to overreach my ability to keep all of the beds clean of weeds, since I prefer breeding to weed pulling. These pictures are taken to document flowers for my breeding program, and I never thought they would be viewed by the public. Please forgive the weeds.